NCFL’s guide to 30 Days of Families Learning Together provides a month’s worth of family literacy activities and practices designed to inspire family memories rooted in imagining, playing, and learning together. These hands-on and wonder-filled activities were hand-selected from our signature programs Wonderopolis and Family Time Machine. The National Center for Families Learning believes the family is the best teacher your child will ever have. That’s why, in partnership with Toyota, we created Family Trails, an online community that celebrates and inspires family adventures and anytime, anywhere learning. Here, you’ll find writings and photographs from a diverse community of families sharing how (and where!) they learn together. A site that provides a convenient, practical, and engaging way for any volunteer from high school students to retirees, to learn important skills that help improve reading outcomes for children. The National Literacy Directory connects more than 50,000 potential students and volunteers to literacy services, education programs, and testing centers each year. Say and Play With Words provides resources for family members and caregivers to engage with infants and young children through everyday interactions. Simple conversations or identifying letters, words, colors, and numbers can begin to nurture and grow vocabulary skills. Simple activities in which parents or caregivers talk to children initiates vocabulary building even in newborns. This site provides free resources for making the most of these interactions and giving children a stronger vocabulary foundation toward their academic success. Renegade Buggies, is an iOS/Android game with financial literacy curriculum designed to engage families in developing basic budgeting and money management skills. In Renegade Buggies, the mission is simple: ride the back of your buggy (shopping cart) down the street and collect a specific amount of money and items dodging nonessential items. The game covers four concepts: unit prices, buying in bulk, coupons, and promotions. The app is made available by NCFL with funding from the Dollar General Literacy Foundation—longtime partners in giving families resources to learn together regardless of the parents’ educational or economic background. Renegade Buggies was created by renowned educational game developer FableVision and is available in the iTunes and Google Play store, as well as on NCFL’s site. 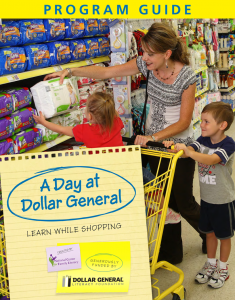 National Center for Families Learning and the Dollar General Literacy Foundation have teamed up to educate families about money management through “A Day at Dollar General: Learn While Shopping.” The online interactive game makes it fun and educational for both children and parents to learn basic budgeting skills. The easy-to-use game helps families start the conversation about money management and is a great tool for parents and children to learn together about how to make smart choices with money. Through the virtual experience of shopping in a Dollar General store, families will learn how to budget, plan a shopping trip, spend wisely and manage money. A site where natural curiosity and imagination lead to exploration and discovery in learners of all ages. Each day we pose an intriguing question – the Wonder of the Day(r) – and explore it in a variety of ways. To see a complete listing of NCFL resources, visit the NCFL Resources page.